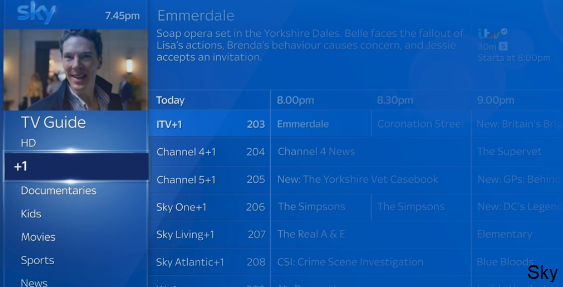 Viewers will have to learn some new channel numbers following a tidy up of the channel list. Sky has completed the biggest channel reshuffle in its history. The changes, made on the morning of the 1st May 2018, mean completely new homes for factual, international and +1 channels, and a reshuffle across most other genres. The pay TV giant says the changes will make it easier to find channels, with the merger of documentary and entertainment channels on the channel list reflecting changes in the type of content shown on factual channels. By popular demand, a516digital has republished and updated some of the FAQs, first published during April. What do Sky viewers need to do? No action is required, according to Sky. However, anyone with an incorrect channel list should reset their receiver (switch off, unplug, wait, plug in, switch on). Are series links and recordings going to be affected? Again, Sky says no action will be required. Series links and recordings will still work through the changes. What has happened to the factual channels? They now sit among entertainment channels in the channel list. Discovery is now on channel 125. Nat Geo is now on channel 129. Together is now on channel 159. PBS America is now on channel 160. Discovery History on channel 171. Discovery Shed on channel 172. Blaze is now on channel 187. However, you can still navigate documentary channels separately via the documentaries tab in the TV guide. Older subscription packages separated entertainment and documentary channels. However, anyone who changes to the new Sky Entertainment pack, which launched a few months ago, will receive entertainment, documentary and some sports channels (e.g. Eurosport). How will I find the +1 of a channel from 1st May 2018? If the main version of the channel is in the 100-199 channel range, then just add 100! Channel 4 is on channel 104, but the +1 is now on 204. Where will I find the HD versions of BBC One, Two, ITV and Channel 4? These channels aren't regionalised in HD as they are in SD. For example, there's only one version of Channel 4 HD, but several different versions of the SD channel with different regional adverts. As long as that's the case, they can't all go in the top positions (101-104). In England, the non-regionalised BBC One HD will be on channel 115. In Scotland, Wales and Northern Ireland, BBC One HD will appear on 101, because here the HD version is the same as the standard definition version. In England, BBC Two HD will be on channel 102. This is because it's identical to the standard definition version. In Scotland, Wales and Northern Ireland, BBC Two HD will appear on 115, because BBC Two HD doesn't carry local programmes for these areas. The positioning of ITV, STV and Channel 4 depends on whether the broadcaster has your local version available in HD or not. Important: Sky says that in regions where it is able to list the HD versions of these channels at the top of the TV Guide, it will move the duplicate standard definition channel to the 800s, where channels 801-804 have been reserved. Where will I find the HD versions of Sky's subscription channels? If you do subscribe to Sky HD, you'll automatically find them in their regular channel slot. If you don't subscribe to Sky HD, you'll find them in the 800s - or, if you select the Entertainment tab in the TV Guide, right at the bottom of the list. I have 'freesat from sky', will this change? Yes. The channel numbering has changed for users of Sky boxes without an active subscription ('freesat from sky'). Not to be confused with Freesat (with a capital 'F'), that's a different platform, using non-Sky boxes and won't be affected. The TV guide has been tidied up in the Movies, Music, Sports, News, Religion, Special Interest, Children's, Shopping and International sections. International channels now start from channel 701, instead of 780. News channels are now grouped into one numerical section, from 501 to 522. Some channels have changed genres: 4Music has moved to the entertainment section and channel 139. VH-1 has moved from 357 to 174. And as announced late last year, ITV Encore has closed; ITV drama can now be accessed via Sky's box sets service. 'VICELAND', now known as 'VICE', has lost its HD channel and moved to 183. What about Sky channel numbers in Ireland? Changes will also be made to the channel numbering system for Sky subscribers in the Republic of Ireland, meaning the documentary and +1 channels will be moving as described above, and the same changes to the other sections will also be made in Ireland. In Northern Ireland, RTÉ will appear on 161 and 162. Is there a full list of the new channel numbers? Republic of Ireland channel as at 1st May 2018. However, as Sky's channels are constantly changing, particularly among smaller channels, you can check the latest Sky listings on Sky's own TV guide.